When I am in Europe, I worship with the Roman Catholics. On a recent trip, my wife and I attended services in the cathedrals of three different cities–Salzburg, Vienna and Prague. Because I speak neither German or Czech, I didn’t get much out of what was said in the sermon, but I did walk out of each service having learned something very important about our Lord and Saviour, His Grace, my faith, our worship–all of which have a little something to do with Protestantism and the Reformation. 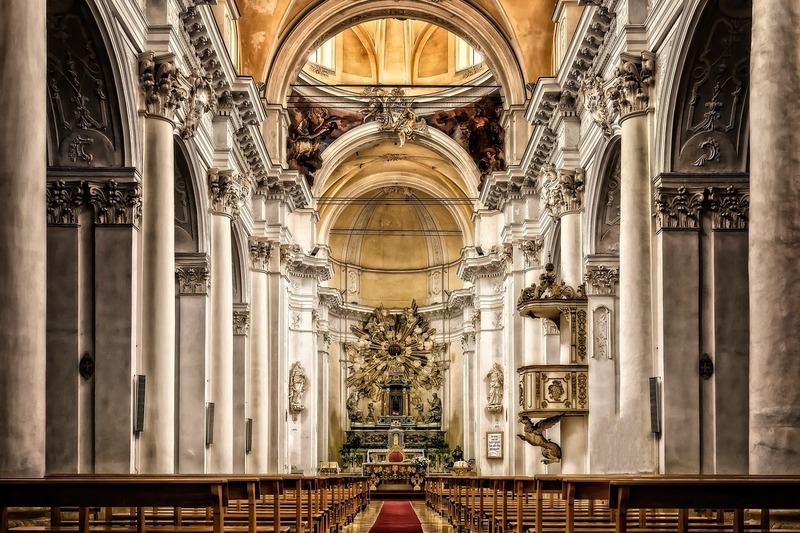 Salzburg Cathedral – from exquisite beauty to holiness. The interior of Salzburg Cathedral is beautifully ornate, but not gaudy. From my humble pew, I looked up and was overwhelmed, and I realized that the encounter with holiness, is facilitated by exquisite beauty. My church at home is very nice, but the priorities are different–utility and stewardship are the guiding principles for construction–and the comfort of the congregants. The seats in my home church are very comfortable. Even in this most beautiful of cathedrals, one always sits on very hard wooden benches. The back is set at almost 90 degreed to the seat. The seatback is capped with a board upon which the kneeling parishioner behind you can rest his elbows, so you can’t really lean back. These were definitely not designed with my comfort in mind. It begins to dawn on me that very little thought has gone into my experience of this service. The music that Sunday morning included an organ, a small orchestra, and more than one choir. These are located behind and above me so I can’t see the musicians. Obviously, the music is not performed for me–I am graciously allowed to listen in. In my home church, it’s not about me either, but the excellent praise band occupies the same place as would a performance band would, so I have to do the work of remembering that they aren’t there for my listening pleasure. I sometimes forget. Pretty much everything in any church service is directed toward the worship of the triune God, but in Salzburg Cathedral, it was so obvious. The building and the music represent the very best of human achievement, and none of it was for me. That I can see, hear and enjoy them is pure grace. The Hapsburgs were christened, married and buried at St. Augustine so this cathedral has seen a lot of pageantry and ceremony over the years. The mass still reflects a polish and flair consistent with this history. I particularly noticed this in the treatment of the elements of the Eucharist. In all Catholic services, the host, what we call, “the bread,” is treated with a great deal of respect. When congregants enter the door, they make the sign of the cross, and they genuflect before entering the pew. Both these actions are directed toward the host. Before, during and after the Eucharist, the actions of the officiating priests all reflect the veneration of the host. This reverence is seen in every Catholic service. In the mass at St. Augustine, all this was done with particular precision and flourish. The explanation for the unfathomable mystery is that there is no unfathomable mystery—the elements are just plain ol’ bread and wine. These are “just symbols” of the body and blood of Christ, and the entire point of the celebration of the Last Supper is to remember this past event. This explanation is a result of the modern tendency to separate the physical from the spiritual, to the detriment of both. The physical elements, then, are reduced to mere “crackers and juice,” and the spiritual dimension of the meal is reduced to mere remembrance. What God did through the death and resurrection of Jesus is inseparably physical and the spiritual. The sacrament by which we remember this redemptive work is not simply a physical symbol, but also an actual spiritual event where Grace intersects with nature, in which a rational human eats and drinks in faith and so, encounters the divine. Does that sound a little perplexing? It ought to be. That’s why it was called an “unfathomable mystery.” While I watched the Eucharist at St. Augustine, I was impressed with the mystery and wonder of it all. I thought I could bring some of this  wonder to my own participation in the Lord’s Supper. St. Vitus has a commanding view of Prague. This Gothic structure stands within the castle complex situated on top of the highest point, so it is visible from anywhere in the city. Getting into the service was a little bit tricky because church officials stood at the door to prevent tourists from entering the church before mass, while at the same time allowing worshipers to pass. We fell into both categories, I suppose, but we entered unimpeded because we approached the door with the confidence of a parishioner. Other camera-toting tourists would have to wait in the long line until the last mass was over. This was the oldest of the cathedrals in which we worshiped on this trip; parts of the structure date back to the 14th century. The age of the church facilitated a connection to the medieval worshipers who also looked up into these same ceiling vaults. I couldn’t understand the homily, so I looked at the windows. Highest and most central in the central window was a depiction of God the Father embracing his crucified son. Beneath these dominant figures were haloed, major saints. All these figures were attended to by angels which were arranged according to their heavenly status. Beneath these were even smaller images of other saints. From my position in the pew, I looked up to them all, reinforcing my place in the hierarchy of the universe. I’m way down here—the least of these. This is a good position for a North American Protestant to be in every now and then. The window presents a medieval reality—a hierarchy. I am a product of the Reformation and the ensuing centuries. So is my church at home. I was recently disturbed to hear a church leader describe the Reformation as a holy response to church corruption. He implied that God’s endorsement of this step toward purity was certain. It is certainly true that corruption pushed Luther and others away from the Roman Church, but we tend to forget that it was also a movement toward something else. It was a step toward freedom—freedom from authority, and would eventually lead to one of our cultures most serious idolatries. The Reformation was the first major step toward this freedom that continues to this day. Rebellion against the authority of the pope was followed by rebellions against monarchies in 1640, 1776 and 1789. In 1882, Nietzsche’s madman, declaring that “God is dead,” captured the spirit of our rebellion against the authority of God. The last century has seen freedom spread into all different directions—and some of these are very good directions. But have you noticed how much we talk about Freedom these days? We sing its praises between innings at baseball games and before NASCAR races— it is now linked with military power and has become the reason we have fought all our wars. Freedom–individual freedom—has become our god, submission has become sin. Any form of authority is evil—even that of our biology. In the absence of this hierarchy, we have placed the autonomous individual at the top of a flattened, dark and lonely reality. This is why individualism ultimately leads to despair. Individualism dominates Western culture and has seeped into our churches as well. It is countered by the windows in St. Vitas. Looking up at the window I experience my smallness through awe, rather than loneliness, and see that the cosmos is full of light and love. The cathedral and mass do not necessarily represent a wholly true view of reality, but they do represent a different reality from the modern ideas that are woven into the fabric of our Protestantism. We might benefit from the admission that some aspects of worship in the cathedral do a little better job of engaging our imagination and allowing us to experience the significance of things.